It was a hot summer day in Houston, Texas and the 38th annual Houston LGBT Pride Celebration® for Pride Houston was about to be underway. This year, more than ever, the city of Houston bound together for a greater feeling of hope and happiness in support of the LGBT community. Staging Solutions was proud to be a part of the amazing group of people that volunteered their time and services to such a great cause. Our involvement with Pride Houston began with our incredibly talented Creative Director Alan Lett and Microsoft’s GLEAM. In 1993 an organized employee resource group – Gay, Lesbian, Bisexual and Transgender Employees at Microsoft (GLEAM) – was launched. GLEAM now has more than 1,000 members worldwide. GLEAM has had a broad impact across Microsoft. The group works to drive LGBT-friendly changes in company policies and work environment, provide support and networking opportunities for our members, and promote activities within Microsoft that raise awareness about its LGBT community. 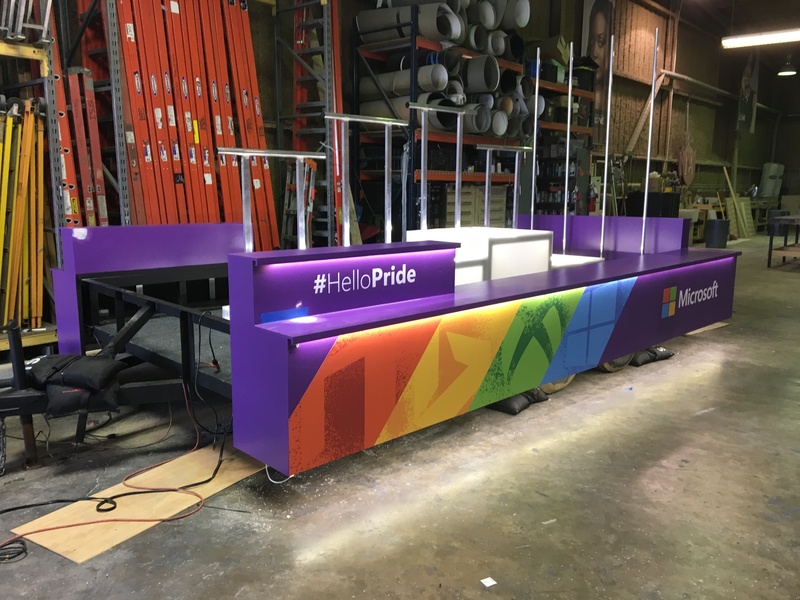 After the success of Microsoft’s participation in Pride Houston last year, they wanted to up the ante this year. Microsoft and Staging Solutions embarked on creating a float for the parade to do just that! 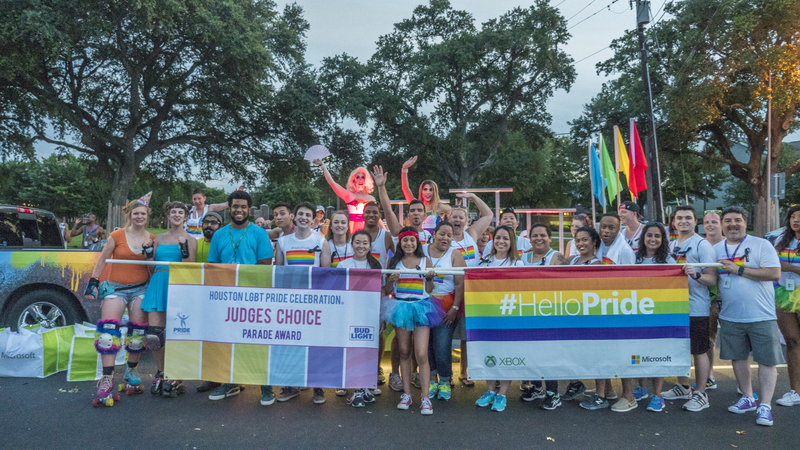 “Having Microsoft be a part of the Houston Pride parade is an event we employees look forward to every year. It’s the biggest LGBT event in Houston and we are one of the many companies in Houston showcasing their support for the LGBT community. Having Microsoft walk down that parade route shows our community that a big technology corporation like Microsoft sees us and hears us. Ensuring we are a part of this iconic event in Houston is non-negotiable for us. We look forward to next year as it will be our fifth year attending the Houston Pride Parade,” said Anthony Ferrell, South Central Market GLEAM Lead. When it came to the parade, this was the first float Microsoft has ever done in any Pride Parade ever. Microsoft stores from Houston, Dallas, San Antonio, Austin and Louisiana came into town to march with Microsoft, Staging Solutions, and the city of Houston in the parade. About 60 people marched with us into the beautiful Houston skyline. 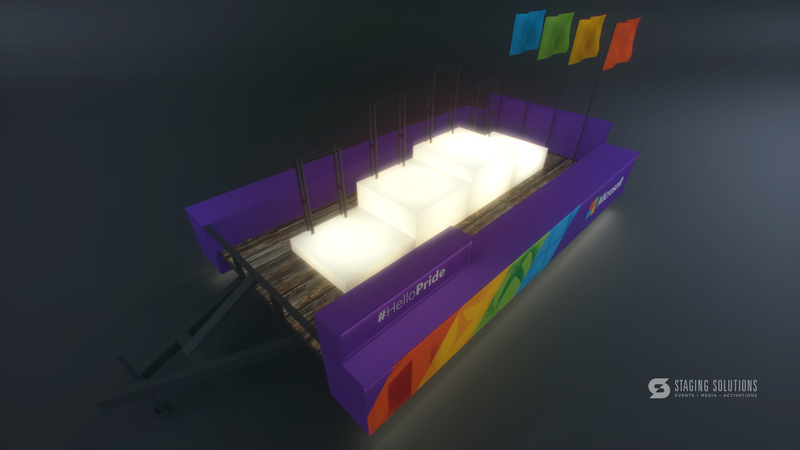 While the 700,000 people that attended Pride Houston this year might have seen our float impressively gliding throughout downtown, a lot went on behind the scenes to bring our concept to life! 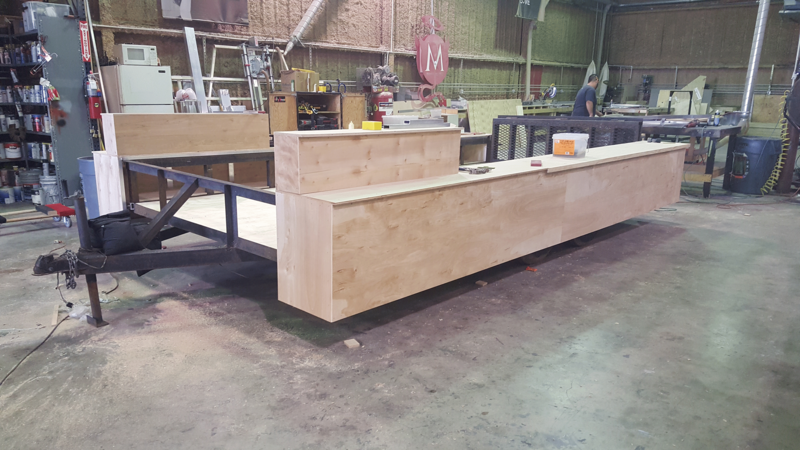 Alan conceptualized the float and then the production team followed through and designed it. 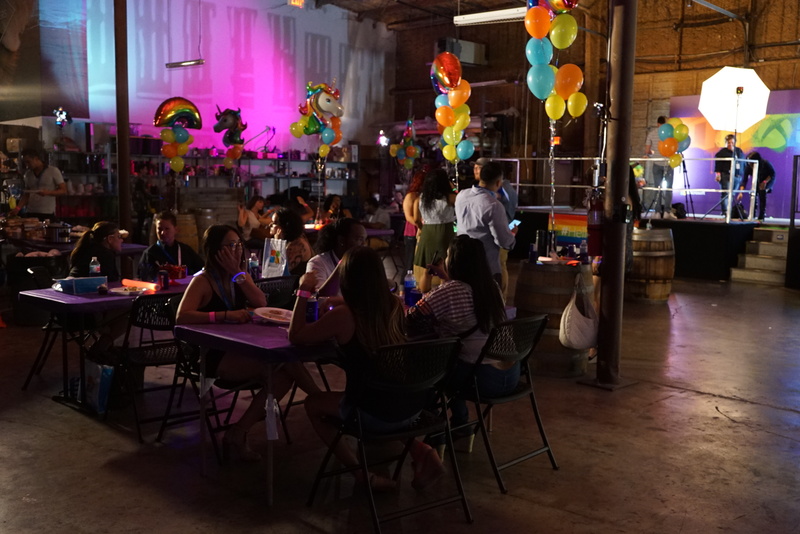 On the night prior to the event, Staging Solutions hosted a casual “preview party” for participants, friends and family in our 20,000 square-foot warehouse. The float was fully-activated and guests could pose in front of it for photo opportunities. The float also served as a stage for presentations and raffle drawings throughout the evening. “I worked together with Alan on the design of Microsoft’s first float and also worked with our lead carpenter, Clemente (Gallegos), on the production of the float. I supervised closely. I did all construction drawings and a digital model of the float that was later passed on for production. Although I was unable to make it to the parade, I had that feeling of pride not only towards how much our city supports the LGBT community but also in watching and having a first row seat in creating something completely new for our client and then to blow their minds, it was awesome,” Navyl Najera, Staging Solutions Designer, said. All of our hard work paid off when the float was awarded Judge’s Choice! The float was unique in its construction because of the use of smooth, polished surfaces and internally-lit platforms. The finished piece stood out among the other floats as more modern, refined and on-brand than any other float in the parade. Along with the float, we produced a special video about Pride Houston and the amazing culture that Microsoft has. We wanted to activate the #HelloPride brand by creating a #HelloPride experience that connected the community and GLEAM. Our concept for the video was to have people introduce themselves and bring a personal element to the company. We wanted to to put a face to Microsoft’s involvement in the LGBT community and beyond. Our team at Staging Solutions was beyond excited to be a part of this journey with Microsoft. “Getting to participate in the pride parade was a phenomenal experience for me. It was amazing to see all the companies who really supported the cause and their employees. Microsoft went above and beyond to really be supportive and I am so thankful I got to be a part of that,” Anastasia Sweeney said.